These full vision showcases are perfect for highlighting jewelry, clothing, and fine collectibles. 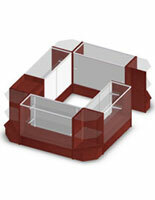 This retail counter display features a lockable design for protecting delicate and expensive items. These showcases, also known as store fixtures, are from the economy line; not as expensive as our high end options, but they hold their beauty well over time. 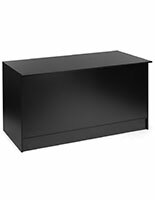 Buy cashwraps and service counters with sliding doors and sturdy tempered shelves and gain plenty of storage room and a generous area for customer interaction whether selling jewelry, clothing, or fine collectibles. 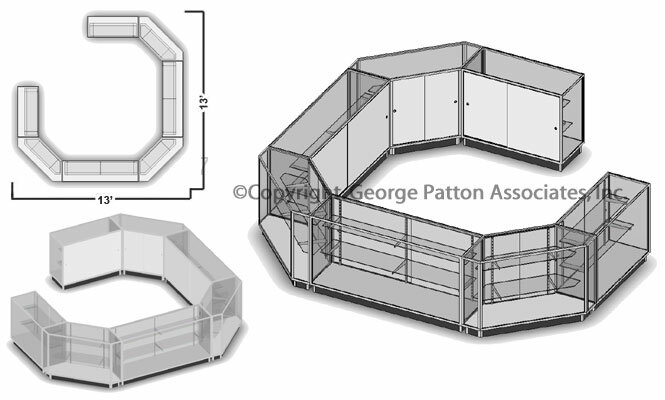 These u-shaped preconfigured showcases, like retail counter displays, are perfect for placing in the center of a showroom where they will draw interest to merchandise and exhibits. 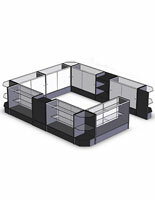 Included with the service counter are:  Corner Counter Units;  48" Service Counter Cases; &  70" Service Counter Displays. We offer this service counter with tempered glass construction to reduce the risk of breakage and injury. 156.0" x 38.0" x 156.0"